If you’ve never had Salted Eggs, you’re in for a treat. 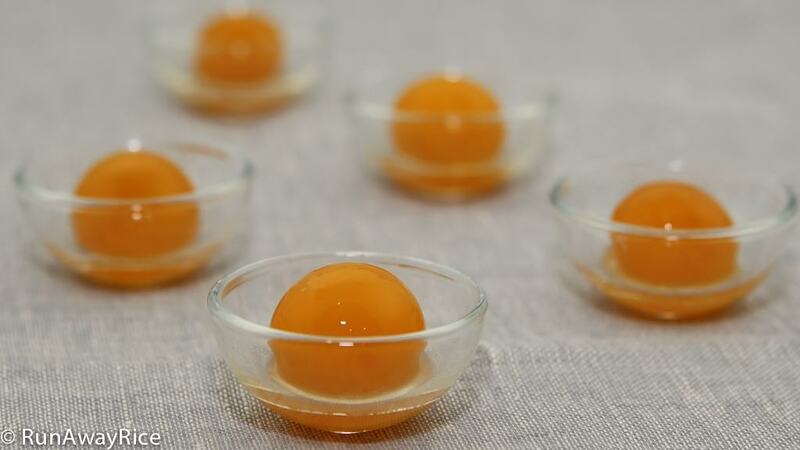 These briny eggs will wake-up your taste buds and have you craving this unique yet simple dish. In this recipe, chicken (or ducks) eggs are soaked in brine and spices permeating them with salty goodness. The eggs can then be hard-boiled, steamed, fried or used as ingredients in other dishes. In future posts, I’ll share some of my favorite recipes using Salted Eggs, so please stop back! Use chicken or duck eggs. Ducks eggs have a thicker shell and ideal for brining. The eggs are fattier and have a rich, buttery flavor. Use sea salt as it dissolves easily. If all you can find is table salt, this will work, but note, this salt will not dissolve completely. The ratio of water to sea salt is 4:1, for every 4 cups water, use 1 cup sea salt. You can easily adjust the recipe to make more or less salted eggs. If you enjoy the aroma of star anise, add 1-2 whole flowers to the brine. The brining time varies depending on the size of the eggs. For large eggs, brine for 4 weeks. If using medium eggs, check after 3 weeks. Crack one open and if the yolk is solid, it’s ready. Letting the eggs brine for too long may result in a yolk that is misshapen. The eggs are super salty so be careful to reduce/omit salt, soy sauce or fish sauce in any recipe. 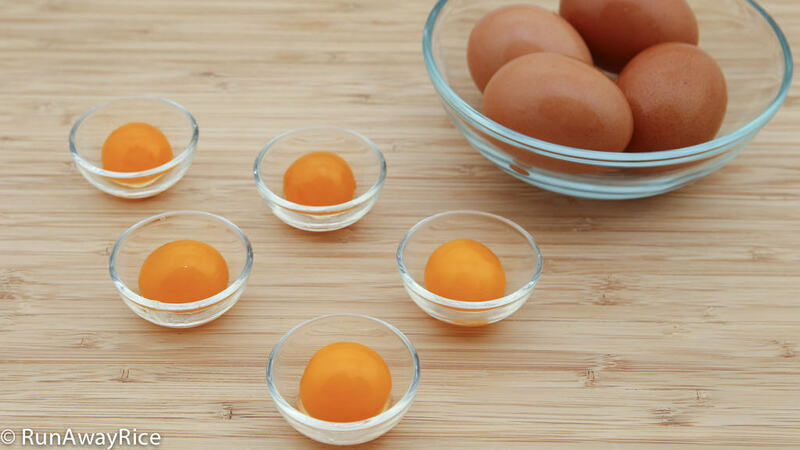 If not using the salted eggs right away, hard-boil the eggs and then freeze for up to 3 months. Please note egg whites do not freeze well. They become rubbery when frozen so when freezing eggs, the edible portion is the yolk. If you enjoyed this recipe, you may also like: Fermented Chili Tofu (Chao), Pickled Jalapenos (Ot Ngam Giam), and Satay Chili Paste (Ot Sa Te). Place eggs into a large colander removing any cracked ones. Gently wash the eggs with cold water and then drain. Add the peeled ginger, peppercorns and vodka into the jar along with the eggs. Pour in the brining liquid filling the jar to the top. Use a flexible plastic lid or a re-sealable plastic bag filled with water to weigh-down the eggs so they are all submerged in the brine. Put the lid on the jar and seal. 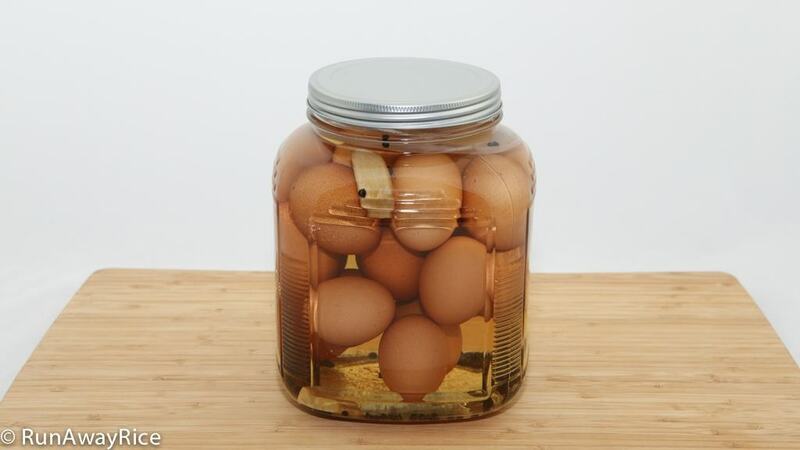 Place the jar on a countertop (away from direct sunlight) or in a pantry and allow the eggs to brine for 4 weeks. After 4 weeks, the eggs can be hard-boiled, steamed, fried or used in other recipes. Hi Trang, is there a brine-to-egg ratio that you recommend? I made the brine with the water-to-salt ratio of 4:1 like you said but I used a smaller 80oz jar. After 4 weeks my (chicken) eggs were still very watery and after 5-6 weeks they are solid but the yolks were not perfectly round like yours. I’m afraid there wasn’t enough salt/brine to “cook” my eggs. Thank you! You can omit the Vodka if you don’t like alcohol. There’s no need to boil the water first for washing the eggs. Using tap water will not make the eggs go rotten. Go luck! Hi Trang, thank you for show us how to make salted eggs will try today.